THE head of Australia's leading body image and eating disorder foundation expressed grave concern about the new Ashy Bines program, telling our sister paper Kidspot that health messages should be targeted at parents, not kids. Controversial Gold Coast personal trainer, Ashy Bines has launched an edu-tainment program targeting children as young as 12 months old. 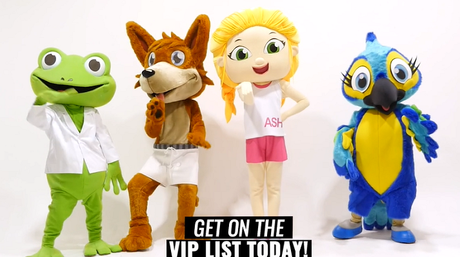 'Ashy and Friends' includes a live show experience and an animated DVD series. It is described in promotional material as "a fun packed music, fitness and education show for 1 to 6 year olds", a "highly interactive experience" that "will have your child singing, dancing, exercising and smiling from ear to ear", and it promises to promote "health and happiness, all while encouraging young audiences to dance, sing and smile!" Ashy, a 29-year-old mother and model, is the woman behind the Ashy Bines Bikini Body Challenge, as well as a number of other exercise and weight loss apps. She has recently faced claims of taking unauthorised credit card payments from app users, parking in a disabled car spot and of plagiarising recipes from bloggers. Short excerpts from the animation series, available on the 'Ashy and Friends' website, include what look like aerobics classes packaged as children's dance and singing time. Kids are encouraged to do jumps in quick succession and to run on the spot for a period of time, for example, while the overview of Episode Two states that children will be shown how to do squats. Beyond that, there is no information about what exercises children will be shown, what messages about weight and body size they may be exposed to and whether or not there was expert paediatric health input into the program. Enquiries from Kidspot about the detail of the program went unanswered. Christine Morgan, CEO of The Butterfly Foundation, Australia's leading body image and eating disorder group, expressed grave concern about children as young as 12 months being exposed to dieting and weight loss messages, telling Kidspot that messages around health and nutrition should be targeted to parents and not to children. "I'm concerned about messaging of dieting that has behind it 'lose weight, lose weight, lose weight'. People call it health management or healthy eating but the messaging behind it is 'don't let yourself put on weight'. So there's an immediate subjectivity that if someone puts on weight that's bad and if they lose weight, that's good," she said. "Now, when you're a little person, you think in black and white. You don't think in shades of grey. You're starting to buy into a whole message that fat is bad and skinny is good and that's absolutely problematic because you can't interpret it at that age. "I would have thought at a young age, for kids, food is about energy in order for them to live their lives - to fuel their little bodies and to fuel their growth. They have got no capacity to understand macro-nutrients or micro-nutrients. That's what parents are there for and for parents to make healthy food choices for them and for parents to encourage them to play outside for healthy exercise. That's where it should start and stop when it comes to any concept of food or diet or exercise or body shape and size." Meanwhile corporate dieting behemoth, Weight Watchers is planning to extend free memberships of their program to children as young as 13. "Our goal is to help those who need healthy habits to develop them at this critical life-stage; this is not about dieting," a statement from Weight Watchers read. "For a limited time around mid-year, teens will be able to join Weight Watchers for free and can continue their membership through age 17. "They will be required to go to one of our meeting locations for their parent/guardian to provide consent, as we know a family-based approach is critical at this age. "We have and will continue to talk with healthcare professionals about specific criteria and guidelines as we get ready to launch this program. We think there's a real opportunity to make an impact on a problem that is not currently being addressed effectively." However, Christine Morgan told Kidspot she finds the initiative "really problematic" and questioned the company's motives. Weight Wachers is "not into doing public health benevolent activity". Christine said. "They call it healthy eating, they call it healthy whatever, but they are a weight loss organisation and they want to sign up new members. "In effect when you go to to Weight Watchers you get weighed. When you go the next week, you're weighed again and monitored. There's a conversation about whether you've maintained weight, lost weight, put on weight and there's an immediate concept here that weight loss is good. "There's implicit, if not explicit assumption that you are there to lose weight and to do that with teenagers is, I think, really problematic." Christine told Kidspot that any concerns about a child's weight should be managed by medical professionals. "Weight and adolescence are medical issues. They're not for someone to make a judgement about whether someone looks to big or not." Body image activist and maker of the film Embrace, Taryn Brumfit also criticised the move by Weight Watchers. "Our kids don't need to be on the scales, our kids don't need to be counting calories or points, our kids need to be encouraged to listen to their bodies through intuitive eating and moving their bodies for fun and pleasure not punishment," she wrote in a viral Facebook post. "No matter how you spin it, dieting is defined as calorie restriction with the goal of weight loss, it's what Weight Watchers is all about. The diet culture promotes shame and fear, misery and disappointment, the scales are no place for our teenagers."